It is a new month and time for opinionated comments and updates. It Shouldn’t Be This Hard: Earlier this week I ordered my February Medicare bundle from Dexcom. I am also in the process of trying to get my 90-day insulin prescription under Medicare Part B. I’ll politely say with no curse words that none of this is going well. I am turning into the “Always-B*tching Blogger” because this stuff is so hard. And it shouldn’t be. I am just trying to do what I did last month and the month before with Dexcom and 3, 6, 9 months ago with Walgreens and insulin. I will eventually get out of Dexcom “Processing” limbo and my supplies will be shipped. Some Medicare recipients have been told that shipments are delayed 7-10 days due to high volume. Long call waits, shipments delays, and moving Call Support to the Philippines have not made Dexcom a popular company in the diabetes online community. ‘Nuff said. And Walgreens will figure out how to get Medicare coverage for my insulin. At the same time, I like the ring of Always-B*tching Blogger and you can just think of me as ABB! The Weather: I have spent winters in Arizona for 15+ years and have never seen snow. That changed last week with 3 inches of the white stuff. Fortunately despite a few downed tree limbs, we had little damage. Finally spring has arrived and the Arizona that I know and love is back. Ground Squirrels: Although my landscape and flowers survived the snow, I am totally losing the battle with ground squirrels. These horrible creatures are “protected” in Arizona and my exterminator isn’t allowed to poison them. Plantskyd which deters rabbits and deer in Minnesota is impotent. My normally gorgeous March geraniums are decimated. This photo is one day after replanting and an ample dosing of Plantskyd. The Dog: All of my readers are kind to read about my dog and her journey through aging and illness. I have come to terms with her limitations and the fact that we only walk half a block twice a day. Otherwise she is happy, eats well, drinks well, poops well, plays fetch with her Bouda giraffe, and wags her tail. Despite me being her caretaker, feeder, medicine dispenser, Bouda thrower, etc., she loves my husband the best and delegates me to #2. Like a teenager, she loves baking in the sun on our back patio. Animas/Medtronic/Tandem: My Animas pump went out of warranty in late 2016, but I still get emails from Animas and Medtronic about switching to a Medtronic pump system. I am committed to Dexcom and see Tandem and maybe Omnipod as my future. Until Medtronic sensors are reimbursed by Medicare, there is no way that I will take a chance on a CGM that is out-of-pocket. At the same time I have struggled for 2+ years with occlusion alarms on my Tandem X2 and have been back using my Animas Vibe trouble-free for the last 3 months. Kinda Whole 30: I have written about Whole 30 and my imperfection at succeeding through 30 days. But I periodically go back on the reset diet and am amazed at how fabulous my blood sugars react to no dairy and no grains. I eat a ton of fruit on this diet and get no spikes. Because I have hosted two dinner parties in the last week, I have once again have strayed from perfect adherence and have had wine. But here is a 24-hour Dexcom tracing that speaks for itself. Thank-you. As always, I am grateful for my online diabetes contacts. Keep up the good fight, my friends, and keep in touch. Without you, my diabetes would be really, really hard instead of just really hard. Diabetes social media makes a difference. We’re ten days into 2019 and life is the same. But not really the same. Oh yeah, it’s probably the same but it’s nice to use the reset of a new year to check out where I am. With things related to diabetes. And things not related to diabetes. I abandon the cold of Minnesota every year after Christmas and snowbird my way to Arizona for 4 months. I have been here about two weeks and we are finally warming up after super cold temperatures and snow in the mountains. We have had a couple of rainy days but mostly the sun shines and my spirits soar. I don’t have to worry about slipping on the Minnesota ice. In early December I wrote about going back to my Animas Vibe pump due to occlusion alarms and other frustrations with my Tandem X2 pump. I went back to the X2 for my endocrinologist appointment later in December because I want my medical records to show nothing other than Tandem use. Medicare Part B insulin and pump supplies require the serial number of my pump and I don’t want to risk coverage nor do I want to put my endocrinologist in a situation of having to fudge on what pump I am using. Then because I was traveling to Arizona, I wanted to wear my in-warranty pump so that if the second pump in my suitcase was lost because of shenanigans while I was being groped by TSA, it would be the old “worthless” pump. But very quickly in Arizona, I got frustrated again with occlusion alarms on my Tandem pump. So I ditched it again and am back to my Animas pump. I called Tandem to report that I was having occlusion alarms and indicated that I just wanted that on my record not a pump replacement. Since I have had occlusion alarms with three different Tandem pumps, I am not optimistic that a new pump will make a difference and I don’t want to deal with it until I have access to the Dexcom G6 and Basal IQ. For Medicare users, that is expected to start happening in April. Until then I will continue with my workhorse Animas pump that delivers insulin and never has occlusion alarms or other intrusions into my life. As always, please note that I am a huge fan of Tandem and do not regret my t:slim X2 purchase. I just regret that I am one of the unfortunate souls who has occlusion alarms and struggles to succeed with this pump. I have previously mentioned that I am giving up extreme hikes of 12+ miles in the mountains to preserve the remaining cartilage in my painful arthritic feet. I don’t want to have foot surgery especially as I am finding that my August hand surgery solved some of my problems but not all of my problems. I have no confidence that foot surgery will turn me into a 25 year old athlete again…. I am finding new activities and am attending fitness classes three times a week. Plus I ride my bike to everything in my community and never use my car or golf cart. So far I have been keeping in touch with my hiking friends and right now for me the social connection is far more important than the athletic connection. A lot of things in my life kinda work but are kinda broken. This is definitely a #1stWorldProblem section. The remote for our main TV does not turn on the tuner or cable box and we must do that manually. If you forget, button pushing randomly turns on some devices and turns off others. When the TV dies, it will require an expensive redo. Until then, we just figure it out and make it work. My husband broke the battery compartment door of my golf laser gun. To get my distance on the golf course, I push up on the bottom of the gun, push the button, and hope to get the distance. Yeah, it works but is annoying and one more challenge for my arthritic hands. But I don’t play a huge amount of golf and don’t want to invest in a new laser gun. When this one works. Sorta. The screen lock button on my iPad is stuck. I should get it fixed but right now I added an Accessibility Feature button that allows me to turn off the screen with a few clicks. Annoying but a cheap fix. The garage door manual close button doesn’t work due to a lightening strike last year. So I have to enter the code which works fine but is an extra kinda-broke step. My August hand surgery fixed one of the bad joints in my left hand. But it didn’t fix the joint that hurts when I play golf. And the bad elbow wasn’t even addressed. So a hand brace and an elbow strap make golf possible. When I flew into Arizona in late December and picked up my husband’s car at the airport lot, the car screamed brake failure and stranded me in a rocky industrial lot north of the airport. AAA, a loaner car, and an eventual warranty repair got me home in a few hours and the car back in our garage a few days later. Thanks heavens that the brakes failed before I got to the highway. We have dealt with a quirky HP printer for several years where it always needs to have its network settings re-entered weekly just to print a crossword puzzle. Finally it got an unfixable error message and we now have a new Epson printer that promises to be more reliable. I hope. New printer=$90. Ink for new printer=$70. Argh! Yeah. My pancreas is still broken. But what’s new??? Abby the Black Lab is doing okay but is in pain due to arthritis and other health issues. She started laser treatments today and the prognosis is good for easing her symptoms. She is still happy and eats and drinks well. And she looks super cool in the doggie sunglasses required during her laser treatments. But she is an old dog and age is not fixable…. Happy New Year to all of my readers and may 2019 be a good year for you and your family. Is it back to the future or forward to the past? What I do know is that this month is my two-year anniversary using a Tandem insulin pump and I just went back to using my Animas Vibe. I am hoping that an older, simpler pump will ease my navigation through the current dark clouds of my Type 1 diabetes. I wrote a blogpost in late November about my diabetes life as a country music ballad and things haven’t changed much. My elderly dog is recovering well from pneumonia but struggling to move around due to arthritis and an injured foot. The cold and cloudiness of late fall continue to trap me in gloom and icy streets prevent neighborhood walks. I have been in an extended funk where my diabetes doesn’t follow the expectations of “If I do A, then B will happen.” A lot of time I do A and seemingly nothing happens. Is it the pump? Is it the insulin? Is it my behavior? 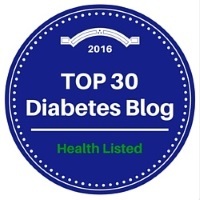 Is it one of Diatribe’s 42 factors that can impact blood sugar? I am burdened by diabetes technology that doesn’t give me sufficient control over intrusive beeps and sirens. But back to the subject of this post. I am using my Animas Vibe in place of my Tandem t:slim X2. I have always relied on the Vibe as a backup pump so it is not a bad idea to road test it after two years in the closet. I figured that I would quickly miss the X2 but have instead discovered that I really like this old pump. I was concerned that going back to scrolling for carb and BG numbers would be horrible but in many ways it is easier than using a touchscreen and navigating through multiple “Are you sure?” screens. I really appreciate the immediate bolus delivery of the Vibe. With Animas, I program the bolus, it whirrs, and delivers insulin before I can get the pump back in my pocket. With Tandem, I program the bolus, it delays for a while, micro-boluses, and eventually finishes with a confirmatory vibrate a minute or two or three later. The Animas clip is a delight with its easy attachment and actually holds the pump securely on my waistband. Temporary basals are simple to enter and a temp basal of zero does not result in an annoying warning alert several minutes later. The Combo Bolus function remembers my last setting rather than requiring a recreation of the split and duration each time. My arthritic hands are having an easier time with the Vibe buttons than with the increasingly stiff T-button on my X2. There are lots of wonderful things about Tandem pumps but I have been one of the unlucky people who gets occlusion alarms. Most users don’t get them. The vast majority of the alarms are false. I just hit “Resume Insulin” and go on my way. Lately I have had a couple of alarms that actually required replacement of the infusion set and/or cartridge. I have done extensive troubleshooting with Tandem over the years and am on my 4th pump. Only one of those pumps did not give me occlusion alarms and it unfortunately had a defective T-button. I never had occlusions in 12 years of pumping with Medtronic and Animas. I am tired of troubleshooting. I sometimes experience one or two occlusion alarms a week and then go a while without them. But after two years of alarms, I think about occlusions almost every time I bolus. I average 8-9 boluses per day and that is a lot of thinking about occlusions. I am tired of holding the pump with the tubing extended post-bolus to prevent occlusions. I am tired of feeling guilty for stubbornly refusing to use the Tandem case and for not changing my cartridge every 3 days. I have a low TDD of insulin and an every 3-day cartridge change results in wasting as much insulin as I use. I do replace my infusion set every 2 days. Longterm I know that I will eventually be back to Tandem. I am probably just being a pouty and whiny problem child. Despite fewer alarms and intrusions into my life, the Vibe has not cured my diabetes but I am doing better. I am committed to Dexcom and thus don’t envision switching back to Medtronic. I am super excited about getting access to the Dexcom G6 and Basal IQ; as someone on Medicare, that should happen in the spring. Hopefully the benefits of Basal IQ and eventually Control IQ will outweigh the insulin delivery problems. An Animas pump is not a longterm option. Johnson & Johnson abandoned the pump market and there is no customer support for my out-of-warranty Vibe. If it quits working or the case breaks, I am done. Fortunately I have a lot of supplies and was recently given enough reservoirs to last for several years. I can use Tandem infusion sets by substituting the t:lock tubing with luer lock tubing. Diabetes Awareness Month is not over so I guess I am allowed to post a blood and gore photo. The bleeding on my belly was much worse than the tissue shows, so just envision 10x the blood of the photo. Oh let’s just be outrageous and imagine 100x the blood! It is still November and I can b*tch about diabetes and the frustrations of dealing with my D-tech. I can be strong on the outside and be sad inside. It is my 42nd November with diabetes and I can do whatever I darn well please. Today was a weird day and it ended up being a perfect 12-hour basal test. My dog Abby had surgery two months ago for a condition called “larangeal paralysis” for which the poster child is elderly Labrador retrievers. The biggest risk of this surgery is aspiration pneumonia. I knew that Abby was sick yesterday and early this morning her lethargy and 103.3 temperature sent us to the emergency vet. She is currently in doggie intensive care inside an oxygen tent with an IV for fluids and antibiotics. We have chosen to treat this episode of pneumonia knowing that we won’t treat again. But I didn’t get breakfast. Then I had previously promised to take care of the grandchildren today. I’m not quite sure why the older ones didn’t have school, but they didn’t. I could have canceled, but since Abby was in the dog hospital, I picked up the kids and we came to my house for Christmas crafts, game time, and doing our best to keep 18-month year old Natalie off of the stairs. I fed the kids lunch but didn’t get around to eating myself. I drove the kids home mid-afternoon and then stopped at Costco on the way home. I got home at about 5:00 and my BG was at close to 100 after starting the day at 80-ish. Over the next 2 hours, nothing much happened. So a perfect basal test. A 20-point rise over 12 hours is testament to great basal rates and I was kinda feelin’ okay about that. I bolused 32g carbs for the Whole 30 stuffed pepper I was having for dinner. The hubby hates dinners like this but he is out of town. Bolus. Tandem pump alarms for an occlusion alarm. Ugh! My TruSteel site was a little sore this afternoon so I changed out the site but not the tubing or cartridge. Tried the bolus again. Nope! Another occlusion alarm. Although I am a Tandem “doesn’t follow the rules” girl, I changed out both the cartridge and the infusion set. I tried to pull the 100+ units of insulin from the previous cartridge but it was mostly bubbles and I just tossed it. When I pulled out the TruSteel set, I got gobs of blood. My bathroom countertop shows the riffraff of my diabetes debris. New infusion set, new cartridge, and new insulin. I bolused again for the stuffed pepper. Last time I looked at my CGM, it was 139 with a slanted arrow up. Remember my BG was about 100 at 6:23pm. So my daytime basals are good as my BG only rose 20 points over 12 hours. But my diabetes tech failed me: both the infusion site and the finicky occlusion alarms of my Tandem pump. I have double-bolused for dinner and my BG is still rising. Well, actually I tripled or quadrupled bolused but the pump alarmed on the first attempts. It is now after 8:00pm and my BG is still rising. I am hungry for dinner but won’t eat until I am convinced that my infusion site, pump, and insulin are functioning properly. It is now 9:00pm and the numbers are not going down. Sometimes the hardest part of diabetes is that when you do it right, it does you wrong. Tuesday morning note: Abby is home and doing well. I recently wrote two blogposts (here and here) about false occlusion alarms on my Tandem t:slim X2 pump. I was not shy about sharing my frustrations and I want to update my story with the fingers-crossed!!! resolution of my problem. I have always had good customer service from Tandem. Despite the long wait times on hold reported by some people on Facebook, I have never had to wait more than a couple of minutes. I have never yelled, cried, or been rude to Tandem tech reps, but lately I have worried that they might start to label me as a “customer from h*ll” as I repeatedly called to report more occlusion alarms. The problem with false occlusion alarms is that when the pump is not shrieking about the stoppage of insulin, it works fine. Thus my pump passed all the tests that that Tandem support had me go through and in the end the in-house reps did not have the authority to authorize a replacement pump. The issue was referred to my local trainer. When my first X2 had weekly occlusion alarms for many months, I met with this trainer to review my technique on reservoir fills and infusion sets. We have a good relationship and when she heard that I had experienced 5 occlusion alarms in 9 days, she arranged for an immediate X2 replacement. The new pump arrived within 24 hours and I have been happily carrying the case-less pump in my pocket. So far there have been no occlusion alarms and I am cautiously optimistic that my problem is solved. Although I am happy with the new pump, I don’t seem to be able to stay away from Velcro. Maybe it is an addiction…. Or maybe it is just the inability to accept diabetes tech when it doesn’t quite fit into my life. Soon I will be heading to South Carolina for a few days in the ocean and pool with grandkids and family. After that I am having hand surgery. Both occasions require a clip on the pump. The Tandem case with a clip would work for the surgery but not for the beach. I want a clip on my pump to attach it to the pants portion of my tankini swimsuit and the case would work for that. But when I am in the water, I want to use my Aquapac pump case (actually a Radio Microphone case) purchased many years ago as a waterproof case for my Medtronic pumps. It is an expensive and somewhat bulky solution that allows me to wear my pump strapped around my waist with guaranteed water protection. The Tandem case is too large to fit into the Aquapac. So I am back to a Nite ize Hip clip applied directly to my pump. Rather than using the two-sided tape that comes with the clips, I use Scotch Outdoor Mounting Tape because it is equally strong but much easier to remove. Unfortunately the Nite Ize clip is only marginally better than the Tandem clip when it comes to falling off my waistband and I applied Velcro hook pieces to both sides of the clip interior to provide some grip. People on Facebook have reported using heat shrink on the Tandem clip but I am not sure how that would work with the different design of the Nite Ize clip. And anyway, Velcro is what I know and Velcro is what I have in my junk drawer. Today I have a new pump that seems to accept living in my pocket without a case. I have a Nite Ize clip applied directly to the pump which allows me to clip the pump to my swimsuit but is small enough to fit into various pockets and the Aquapac pump case. The clip is attached to my pump with a strong tape that is easy to remove when I decide to go clip-less or use the case instead. Pump. Clip. Velcro. No occlusions. That just about sums it up. Last week I published a blogpost addressing my annoyance with false occlusion alarms on my Tandem X2 insulin pump. Periodically Tandem techs have advised me that using a case might eliminate the alarms and that has actually been my experience. But I hate the case which makes the pump heavy and bulky instead of slim and sleek. Thinking that maybe adding something to the pump to protect the vent holes might mimic the case, I experimented with attaching a black plastic ring to the back of the pump. In my typical stubborn fashion, I put the case-less and clip-less pump back in my pocket. Fast forward to Saturday where I had another occlusion alarm—the 5th alarm in 9 days. (Please note that these alarms stop insulin delivery so they are a serious problem.) Not only did the blogpost jinx me, one of my Facebook friends who never gets occlusions got an alarm on her X2. Then another friend got an occlusion on his Medtronic pump. Occlusions are spreading like wildfire through the diabetes pumping community! Maybe the wildfire remark is an overreach, but I cried uncle and put my pump in a t:case vowing to wear it clipped to my waistband. Unfortunately I had previously broken my black case and was stuck using the pink case which I don’t like. Boy, do I sound like someone with a severe case of #1stWorldPrivilege! In my defense, Amy Tenderich of Diabetes Mine figured out a long time ago that design is important for diabetes devices and her 2007 “Open Letter to Steve Jobs” went viral. The 24 hours that I wore the pink case reinforced now much I hate it. Both the shade of pink and the amount of black showing through the cutouts bug me. I decided to purchase a new case and was disappointed that black is out of stock in the Tandem Online Store and at Amazon. So it was back to the drawing board. I devised a minor engineering solution to secure the Tandem clip to the broken case by using Velcro in place of the missing plastic anchor strip. So far it is working and my fingers are crossed that the fix will be durable. The Velcro does double duty by adding “grab” to help prevent the pump from sliding off my waistband, an unfortunate common t:case problem. So it has been another-day another-adjustment to diabetes tech. If I continue to get occlusion alarms on this pump, I will now be totally justified in battling for a replacement pump. If a case solves the alarm problem, I should be happy. But I will still be frustrated. Frustrated that Tandem promotes the small size of the X2 with photos of the case-less pump. Frustrated that many people use the t:slim successfully without a case and I can’t. And maybe most importantly, frustrated that I still don’t understand why. 7/30/18 Afternoon: I need to stop publishing blogposts because once again my fix that was successful for two days FAILED. The clip slipped out of place and the pump fell off my waist mid-morning. Ugh! My latest solution to prevent going back to the pink case is to attach a Nite Ize clip to the back of the case using strong outdoor adhesive tape. There are various pieces of Velcro on the inside of the clip to make sure the pump stays put. Although I do not miss my Animas pumps in many ways, I do miss the clip that easily attached to the pump and held it tightly on my waist. Periodically I have thought that I have solved the problem and interestingly I have had completely different experiences with my three X2 pumps. Pump #1 got weekly occlusion alarms during the first four months of use. I eliminated the alarms by either using a case or wearing the pump on my waistband with a Nite Ize Clip. But I hated those solutions and eventually went back to carrying my case-less and clip-less pump in my pocket. For no discernible reason the occlusion problem didn’t reoccur and I only had two or three occlusion alarms in the next 11 months. In February 2018 Pump #1 was replaced due to a battery failure. I only used Pump #2 for a month due to a defective T-button. But in that time I did not have a single occlusion alarm. Then I got Pump #3 and immediately returned to weekly occlusion alarms and sometimes two or three a week. I figured these alarms were the price of refusing to use a case or clip and I just lived with them. Then a couple of 2-alarm days convinced me that enough is enough. I dug the case out of my supply box. The pump became heavy and large with the case and would no longer would easily fit into the waistband pockets of my workout pants and pajamas. Total PITA. But I didn’t get occlusion alarms. Hating the case, I went back to the Nite Ize clip with the pump on my waistband. And ugh, I started getting occlusion alarms again. So now my question became: Why does the case eliminate false occlusion alarms? A Tandem tech rep once told me that the case eliminated temperature fluctuations that occurred when I took the pump out of my pocket to enter a bolus. Seemed kind of far-fetched and if that was the case, why doesn’t everyone who carries the pump in their pocket get occlusion alarms? And when I was wearing the pump on my waistband with a clip, why did I get occlusion alarms because there was no temperature change? My current hope is that the case works because the cut-out over the pump vent holes stops the vents from being blocked during insulin delivery. How could I replicate that without using a case? On Tuesday I went to the nearby Ace Hardware and wandered down the aisle with screws, washers, nuts, springs, etc. I bought a couple of gizmos including black plastic rings with a hole large enough to protect the 6 vent holes on the back of the pump. (It should be mentioned here that there are constant discussions on Facebook about the purpose of these tiny holes and some people swear that they are only for sound. A Tandem tech rep recently told me that the holes are dual-purpose and function both as vents and speaker holes. So that’s what I am choosing to believe.) I also bought 2-sided adhesive strips. It will take a week or two to see if this MacGyver fix works. I started a new cartridge yesterday and I rarely get occlusion alarms until the cartridge measure 80-120 units. If I make it a week without an occlusion alarm, I will have to see what happens with my next cartridge. And then another. Diabetes. A science experiment that sometimes requires engineering solutions. Other Comments: I truly believe that false occlusion alarms are related to a design flaw in Tandem pumps. I have so many questions. What percentage of Tandem pumpers experience these alarms? It is hard to tell because social media only attracts those having the problem. Are there common characteristics for those of us getting the alarms such as low TDD of insulin and small boluses? Or is it that certain pumps have overly sensitive occlusion sensors? I could go on and on with questions. At the same time I want Tandem to succeed. I like almost everything about my t:slim X2 and I appreciate the innovation and good customer service that comes from this company. There are few pump choices these days and my being on Medicare reduces that number even farther. My primary D-tech loyalty is to Dexcom as my CGM and I am unlikely to return to Medtronic although I was previously happy with my Medtronic pumps. At this time Omnipods are not a good financial option for many of us on Medicare and I have always been fine with a tubed pump. I am intrigued by Bigfoot Biomedical using the Freestyle Libre and keep my fingers crossed that it will be a future option for me. I do not follow all of the Tandem rules. Because of my low TDD of insulin, I refuse to change my cartridge every 3 days and throw away more insulin than I use. I change it about once a week while replacing my infusion sets every two days. This was how I operated on Medtronic and Animas and it works for me. With my first X2 I tried changing the cartridge every 3 days a few times and still got occlusion alarms. I have always had superb customer service from Tandem. Although I am continually frustrated by false occlusion alarms, I do not regret my choice of the Tandem t:slim X2. If I had to choose a new pump today, I would probably choose the X2 again. But false occlusion alarms are a problem. Starting with the Dexcom G4 released in 2012, I have bolused insulin based on my CGM. Although the G4 was not FDA-approved for insulin dosing, I was comfortable doing so “sometimes, in certain circumstances, and within certain guidelines.” That quote comes from a 2013 blogpost titled “To Dose or Not to Dose” and explains that I mostly trusted the Dex but averaged 8 fingersticks per day. Fast forward 5 years. I regularly dose insulin off my Dexcom CGM and only average 4 meter tests per day. That average reflects sensor day 1 where I might test 8 times and other days where I may only test 2-3 times. The Dexcom G5 is somewhat more accurate than the algorithm of the original G4, but the difference is only a couple MARD points and not a huge statistical variation. So what has changed that I have eliminated at least 4 meter tests per day? What has changed is Me. I have 10 years of CGM usage under my belt. The early years of Medtronic SofSensors were rocky with a huge improvement when I moved to the Dexcom 7+. The 7+ was reliable for trends but I don’t remember trusting it enough to guide my bolusing decisions. With the mostly reliable G4 numbers, I frankly just became lazy about using my BG meter. I had good insurance with no need to ration test strips and no issue poking holes in my fingers. I was just lazy and welcomed a small reprieve from a few daily diabetes tasks. Before I knew it, the laziness turned into a habit. It was initially a guilty habit but over time CGM reliance became entrenched in my diabetes decision-making. And guess what. It didn’t kill me! And now it is FDA-approved. Lately I have been frustrated with inconsistencies between my meter and my Dexcom numbers. It drives me crazy. I have always had issues with Dex sensors reading low. As I increasingly target normal-ish BG numbers, the Dex low tendency often results in alarms for lows that aren’t lows. Dexcom screams 65; meter says 85. Maybe I calibrate and Dex goes up to 75 before dropping back down to the 60’s. I know that numbers showing up after calibrations are determined by “The Algorithm” but sometimes if I enter 85, I just want the receiver to say 85. My perfecto personality overreacts to diabetes numbers. When my meter and CGM feud, I calibrate too often. I over-manage blood sugars. I get lows and highs as I target perfection and my mental health meter explodes. Do I start testing 8-12 times a day like in the old days? Do I donate the CGM to Goodwill? I just move to Planet Dexcom and go with the flow of CGM numbers. I test less. Although Dr. Bernstein might disagree, I believe that when you are 66 years old with 42 years of diabetes under your belt, 20 or 30 points here and there probably doesn’t matter a lot. Especially if I have a flatter CGM tracing because of fewer peaks and valleys. By not obsessively using my meter, I might miss some large Dexcom/meter discrepancies. At the same time, it hasn’t killed me yet. I am mostly hypo unaware. But because I have had so few catastrophic lows since the introduction of Dexcom G4, I have some confidence that if I pay attention to my body and my diabetes devices, I am somewhat protected from incapacitating lows. Remember. It hasn’t killed me yet. Note: Because I am on Medicare, I am using the Dexcom G5 and it will be a while before I have access to the G6. I find it interesting that many of the early-users of the G6 which requires no calibration are celebrating its accuracy. Simultaneously they are claiming that they are not using their BG meter. So actually they don’t know how accurate it is. They are living on Planet Dexcom and finding that it is a relatively safe and happy place to be. Some other CGM planet in the diabetes universe.